MONTEREY COUNTY – Construction work on the existing retaining wall will required only one full overnight closure of State Route 1 at Paul’s Slide (PM 21.6) and tonight’s overnight closure will no longer be necessary. The highway closed from 10 pm to 6 am Sunday night into this morning. Paul’s Slide suffered major storm damage in January, 2017, losing part of its embankment including the southbound lane and closing for several months. Paul’s Slide near Limekiln State Park remains active and continues to be monitored. It has currently been operating under a temporary traffic signal for over a year and the signal will remain in place. John Madonna Construction of San Luis Obispo is the contractor for this project. 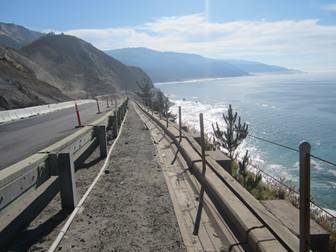 Construction work on the existing retaining wall at Paul’s Slide will ensure a safer environment for all travelers.